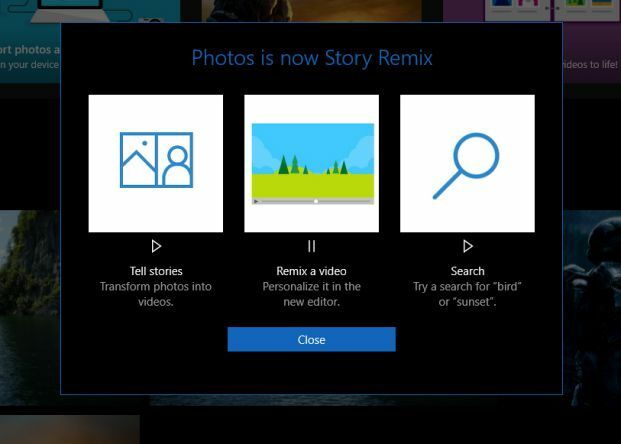 Microsoft has renamed its Photos app to Story Remix in the latest update. The software giant has released a new Photos app update for the Windows Insiders on Redstone 4 update builds with this new change. According to the company, they are testing a few different name choices for the Photos app and the name is not final yet. Recently, Microsoft added multiple new features to the Photos app. With the Photos app or Story Remix app, you can quickly create video clips from photos and videos in your library, complete with music, transitions, and text. The company is also working on Story Remix apps for mobile devices like Android and iPhones, so the app on Windows 10. Apart from a new name, there is no new feature in this update. Story Remix app will roll out later this year with the Windows 10 Fall Creators Update.